Lydia Ko, the former world No.1 amateur, made her professional debut just last month in the LPGA’s season-ending Titleholders Championship in Florida, and has now won the Swinging Skirts World Ladies Masters event in Taiwan, in just her second start in the professional ranks. 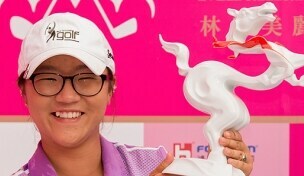 Lydia Ko / AFP The 16-year-old Kiwi sensation took out the Swinging Skirts World Ladies Masters in Taiwan by three strokes on Sunday with a final round -3 under par under 69 to finish the tournament at -11 under par. This was a three shot win for Lydia, who had to come from behind. Lydia was surprised she was won so quickly after turning professional; “I didn’t know I’d do it this quickly, I’m just so fortunate to do it at such a great tournament. I was nervous, but I just said to myself, `Concentrate on your game." This was no easy win, this event included four of the top seven players in the world rankings. Finishing in second place was South Korean Ryu So-Yeon, the overnight leader by one stroke over Lydia, but she collapsed badly on the back nine, dropping four shots in the space of seven holes. Third place was claimed by another South Korean, world No.1 Inbee Park, who was one shot further back, closing with a -2 under par 70.